An elegant, high quality Chinese porcelain fishbowl. 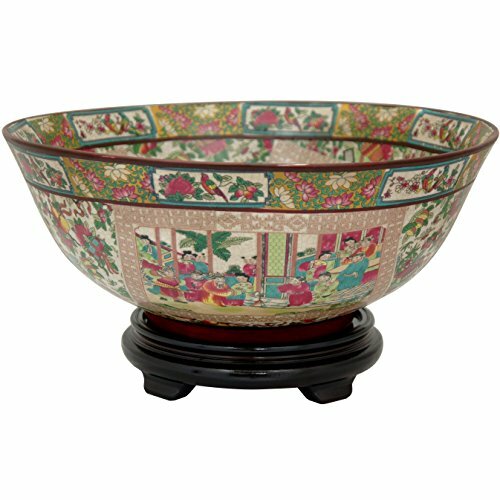 Features a brightly colored applique eacute; of an Asian Courtyard scene surrounded by an intricate floral and medallion pattern, fired onto the porcelain in a kiln. The lip of bowl features a Rose medallion style band of finely detailed Lotus and bird art. Traditionally used to house Goldfish and Koi; now commonly used as planters for small houseplants or as elegant decorative accents in their own right. 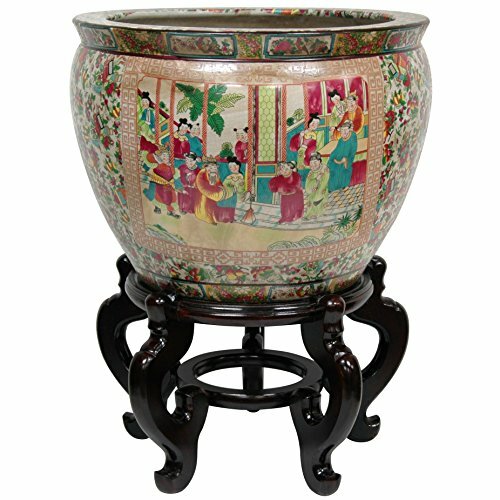 Spirited and vibrant Chinese porcelain umbrella stand comes 18" in height. Painted with a beautiful and rare Rose medallion landscape scene, the porcelain umbrella stand is both artistic and functional. Rose medallion originates back in the 19th century and holds unique characteristics in design. Illustrations have a central rose, peony, or bird with the landscape. The Chinese porcelain umbrella stand is painted with overflowing pinks, green, red, and yellows. 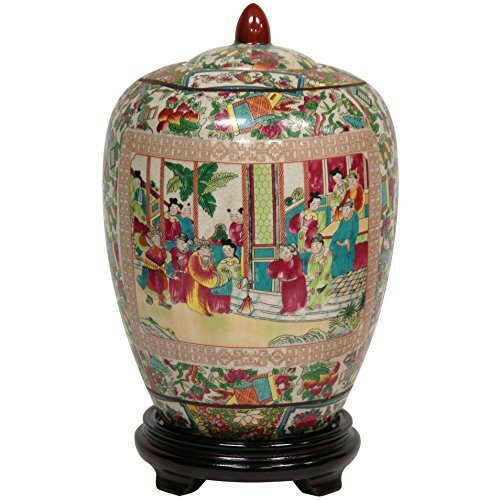 The wedding illustrated landscape on the painted umbrella stand is very lively and colorful to exemplify a narrative scene often to mark an authentic Rose medallion Chinese porcelain. The rare and beautiful umbrella stand would look great in a foyer, or on a table top as a flower holder or vase. 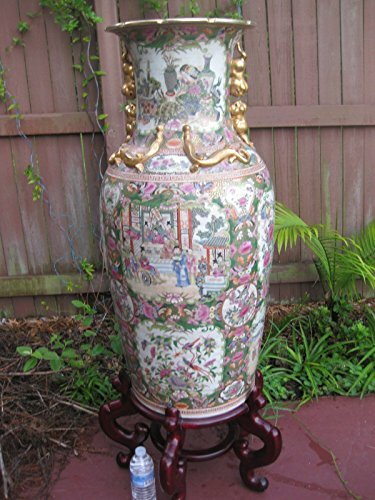 A very traditional piece in antique Chinese decor, an 8" pedestal stand is recommended to enhance display. 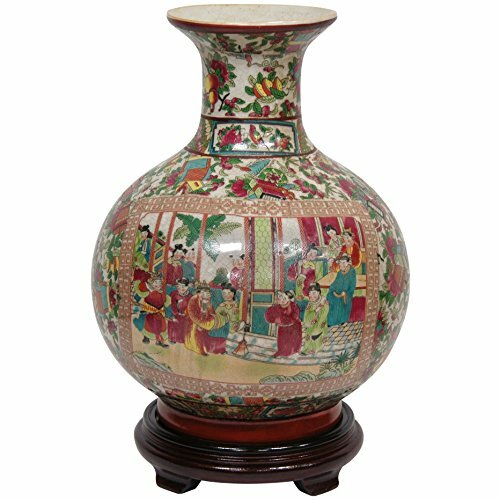 A beautiful porcelain fishbowl featuring a brightly colored appliqué of floral patterns and stylized images of an Asian court scene, fired onto the porcelain in a kiln. The lip of bowl features a Rose Medallion style band of finely detailed lotus and bird art. Historically used as large fishbowls in palaces; now commonly used as decorative accents or large planters for indoor trees. Fun, colorful Asian decor for the home or office. Traditional round bodied porcelain vase with a narrow neck and wide rim. Features an appliquéd colorful courtyard scene surrounded by a medallion border, fired onto the porcelain in a kiln. Festive pattern with oriental object motif. Traditional Rose Medallion panel style bird and lotus paintings on neck and base, above a bright red band. Finished in a medium gloss crackle glaze. 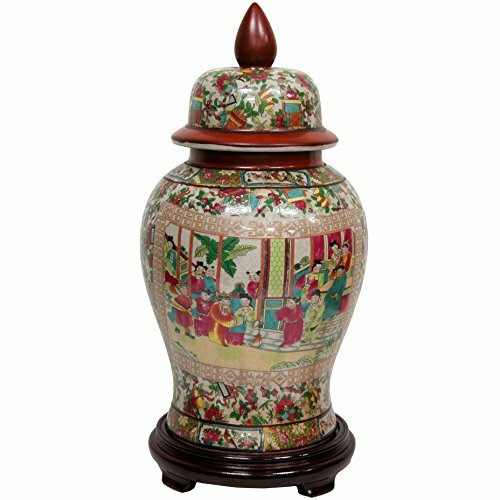 Large porcelain temple jar with removable lid and high shouldered design. 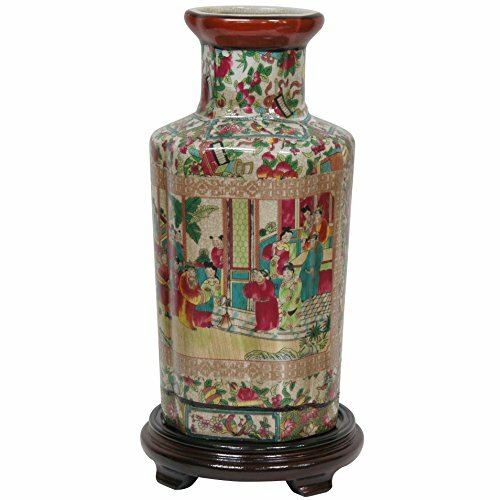 Features an elaborate appliquéd oriental object motif pattern surrounding a colorful Asian courtyard scene, fired onto the porcelain in a kiln. Accentuates traditional Rose Medallion panel-style lotus and bird art around top and bottom rim. Lid, neck, and finial painted a traditional warm red. Porcelain is finished in a medium gloss crackle glaze. Display on a console, end table, or bookshelf, alone or in pairs, as a bright, authentic oriental accent. Distinct curved hexagonal vase design featuring high shoulders and a short neck. Crafted from high temperature fired, strong Chinese porcelain. Accentuates an appliquéd colorful Asian courtyard scene surrounded by an oriental motif pattern, all fired onto the porcelain in a kiln. Traditional Rose Medallion style panel art around bottom. Finished in a medium gloss crackle glaze. Display as a standalone vase, with cut flowers, or with live bamboo. Traditional decorative Asian spice jar. Features a hand applied appliqué of an oriental courtyard scene surrounded by a medallion border and colorful fruit and flower patterns, fired onto the porcelain in a kiln. Top and bottom band feature Rose Medallion style panel art with lotus flowers and birds. Porcelain is finished in a medium gloss crackle glaze. Large decorative painted bowl. Constructed from high quality, high temperature fired Chinese porcelain. Features hand applied images of an Asian courtyard scene, surrounded by a bright Oriental fruit and floral motif pattern, that is fired onto the porcelain in a kiln. The porcelain is finished with a medium gloss crackle glaze. Use as a decorative display for potpourri, fruit, or candies, or on a pedestal stand as a purely decorative bowl. An elegant, high quality Chinese porcelain fishbowl. Features a brightly colored appliqué of an Asian courtyard scene surrounded by an intricate floral and medallion pattern, fired onto the porcelain in a kiln. The lip of bowl features a Rose Medallion style band of finely detailed lotus and bird art. Traditionally used to house goldfish and koi; now commonly used as planters for small houseplants or as elegant decorative accents in their own right. Size: 12 diam. x 8.5H in. Antique 19th c. Chinese Rose Medallion Porcelain Painted Decorative Plate -RARE!